Having a Crucifix in our homes and frequently kissing and venerating it is one of the most profitable and consoling spiritual exercises. Jesus Himself has often approved of this devotion and given it the blessing of many indulgences and promises. And, astonishing us with His immeasurable Love, He has said to St. Gertrude, that He loves each and every one of us so much that, His Heart still burns so much with Love for us that, if it were beneficial or necessary, He would be ready to endure for each of us alone, just for you and for me, what He endured and suffered for the whole world. How much should we not love Him in return, and how grateful should we be for such undeserved Love! Re: On the unfathomable Love of Jesus for each of us - Jesus on the Crucifix. Thank you so much! I am printing this out! Some other promises Our Lord made in this connection, from Flavio Raposo's Pilgrim's Guide to Paradise. 1. Those who expose a Crucifix in their homes or place of work and decorate it with flowers will reap many blessings and rich fruit in their work and undertakings, and immediate help and comfort in their cares and suffering. 2. Those who look at a Crucifix only a few minutes when they are tempted or in battle or struggling, especially when tempted to anger, will at once master themselves, the temptation and sin. 3. Those who daily meditate for fifteen minutes on My Agony on the Cross will at once support their suffering and annoyances, first with patience, then later with joy. 4. Those who very often meditate on My Wounds on the Cross with deep sorrow for their sins and guilt, will soon attain a deep hatred of sin. 5. Those who very often, at least twice daily, offer up to the Heavenly Father My Three Hour Agony on the Cross for all neglects, indifferences and failures to follow inspirations will shorten or be completely spared of the punishments for them. 6. Those who gladly pray the Rosary of the Holy Wounds with devotion and great trust, while meditating on My Agony on the Cross, will obtain the grace to fulfill well all their duties, and by their example, will inspire others to do so. 8. Those who pray the Way of the Cross daily over a long period of time and offer it for the conversion of sinners, can save a whole parish. 9. 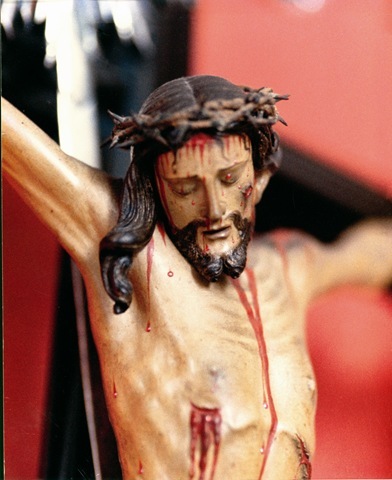 Those who three consecutive times - it need not be in one day - visit an image of My Crucifix, honour it and offer to the Heavenly Father, My Agony and Death, My Most Precious Blood and My Wounds for their sins will have a beautiful death, will die without agony or fear. 10. Those who every Friday at 3 P.M. meditate on My Passion and Death for fifteen minutes, offering them up with My Most Precious Blood and My Wounds, for themselves and for the dying of the week, will achieve a high degree of love and perfection, and can be certain that the devil won't be able to do further spiritual or bodily harm to them.